The Study of Taiwan History has become a flourishing academic field in post-Martial Law Taiwan. 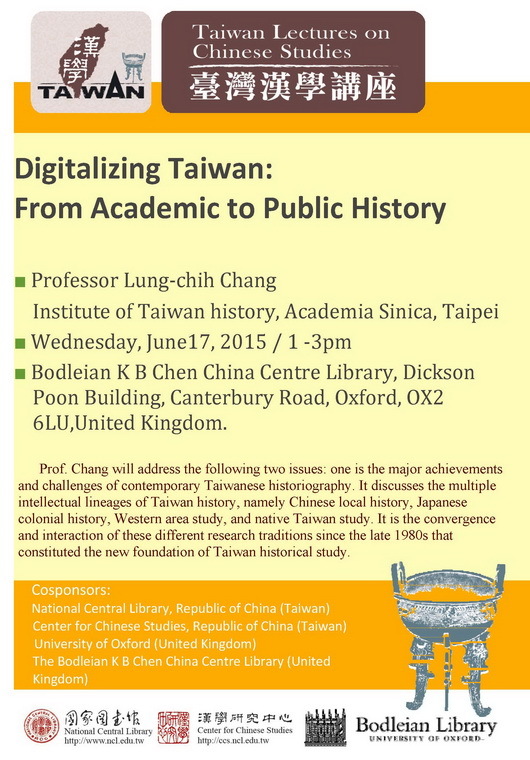 And the efforts of digitalization provide important impetus and new perspective in the development of Taiwan studies. This lecture will address the following two issues: one is the major achievements and challenges of contemporary Taiwanese historiography. I’ll discuss the multiple intellectual lineages of Taiwan history, namely Chinese local history, Japanese colonial history, Western area study, and native Taiwan study. It is the convergence and interaction of these different research traditions since the late 1980s that constituted the new foundation of Taiwan historical study. I’ll illustrate the representative developments in source collection, research agenda, institutionalization and internationalization of this young and vibrant discipline. In terms of the impact of digitalization projects, I’ll introduce five major research and archival institutions in Taiwan: namely Academia Sinica (Zhongyang Yanjiuyuan), Academia Historica(Guoshi Guan), National Taiwan University, National Taiwan Library, and National Museum of Taiwan History. The collective efforts in the preservation, research, and promotion of Taiwan historical resources not only improve the width and depth of academic research but contribute to the shaping of new public memory and cultural heritage in Taiwan. The lecture will conclude with some personal observation and reflection on the future challenges of Taiwan history from the perspective of a practicing historian. This paper examines the synergy between religious traditions in China and Taiwan during the Japanese colonial and Postwar eras. 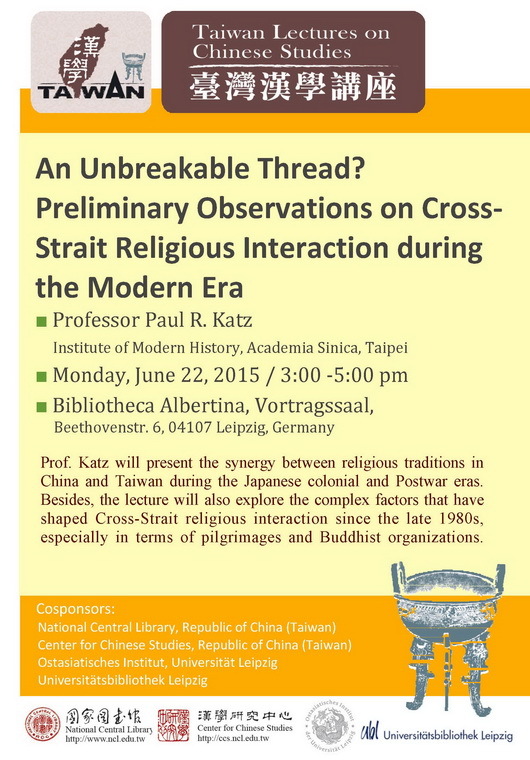 In contrast to much conventional wisdom about Japanese rule, which assumes that religious ties between China and Taiwan were severely disrupted, I attempt to show that extensive contacts took place between specialists and worshippers on both sides of the Taiwan Strait. for the Postwar era, I explore the complex factors that have shaped Cross-Strait religious interaction since the late 1980s, especially in terms of pilgrimages and Buddhist organizations. Based on a broad-based approach designed to stimulate new research (as opposed to the in-depth investigation of a single case study), this paper covers a wide range of religious phenomena. Apart from the ways in which Cross-Strait links shaped the development of organized religious movements such as Buddhism and Daoism, I also consider their impact on communal religious traditions as seen in pilgrimage networks for popular deities like Mazu 媽祖, the Great Emperor who Protects Life (Baosheng dadi 保生大帝), and the Royal Lords (wangye 王爺). Another key topic involves the interaction between Chinese and Taiwanese sectarian traditions, both in terms of religious leaders and scriptures such as morality books (shanshu 善書). Taiwan’s place in the transnational religious networks encompassing both sides of the Taiwan Strait, including those involving philanthropy, education, and mass media, will also be considered.